MEOW! My name is June Buggie, and I have something to say. Us cats have gone out of our way to be accommodating to that big, overgrown wad of fur that you all think is so cute…. *gag*. But now he’s going entirely too far! 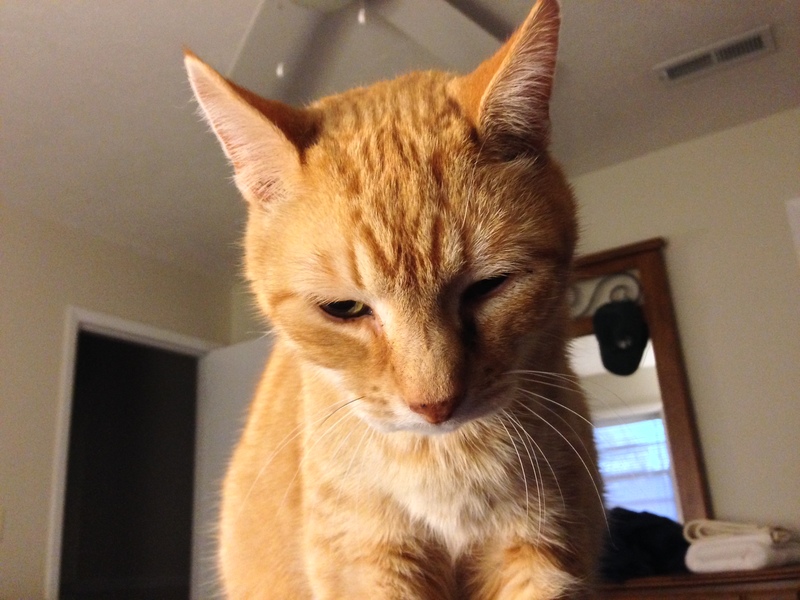 You see, when Malachi had his annual check-up, the vet said he could stand to lose a couple pounds, so Jen switched us all to a food for old cats. CAN YOU BELIEVE THAT???? We slowly transitioned over so we’ll eat the stuff, and I guess I like it OK, but guess who likes it better than his own food? You guessed it! So to expose him for the thief that he is, us cats got together and wrote a limerick to call him out. so he cleans out the plates too, the cheat! Oh no! What a naughty fluffy thief! Cats, us dogs can’t help it if your food tastes so good. I don’t blame Rumpy a bit. I’ve got to counter surf to get the cat food at my house. I’m glad we don’t at my house! Cat’s don’t free feed here. We are fed 2 times a day. We’re fed on the floor because we have limited counter space and we do like to fuss over our food a bit. MEOW! MEOW! I am, aren’t I? It may come to that yet. Jen is adamant that we lose a bit of weight. We went from free-feeding to two meals a day. She hasn’t been so strict because we move from bowl to bowl. Now we’re on a lower calorie food. HISSSSS!!!! I feel ya! Here it would be too. Wonderful limerick that describes it all. Rumpy can be an imp at times. That’s putting it mildly. MEOW! How perfect, guys! You ‘outed him’! haha! aww poor kitties!! Love your little poem though!! Have a great weekend! My sympathy is with Rumpy on this one – if you cats ate your food straightaway instead of messing around he wouldn’t be tempted. Sometimes the temptation is more than a dog can stand! Hai dearest June Buggieeee!!!! Oh no! I can’t believe that you started eaing a food for old cats!? You still look so young and very charming!!!! *whispers* but one of our cats, too…he is said to loose his weight by his vet…. That dog has no shame! HISSSSS!!!!! Yikes! That’s pawful! I’d share my food with you, but I’m on a d.i.e.t. and don’t get all that much anyway. I like that poem! Cat food in this house is only served on top of the refrigerator (which the cats have a special access platform to) … otherwise it’s gone gone gone! BUSTED fur SURE….. Nice Poem June Buggy. We know that problem all too well. We have the cat food up high, and a kitty litter box blocked off so only the cat can get to it. That’s an excellent limerick! 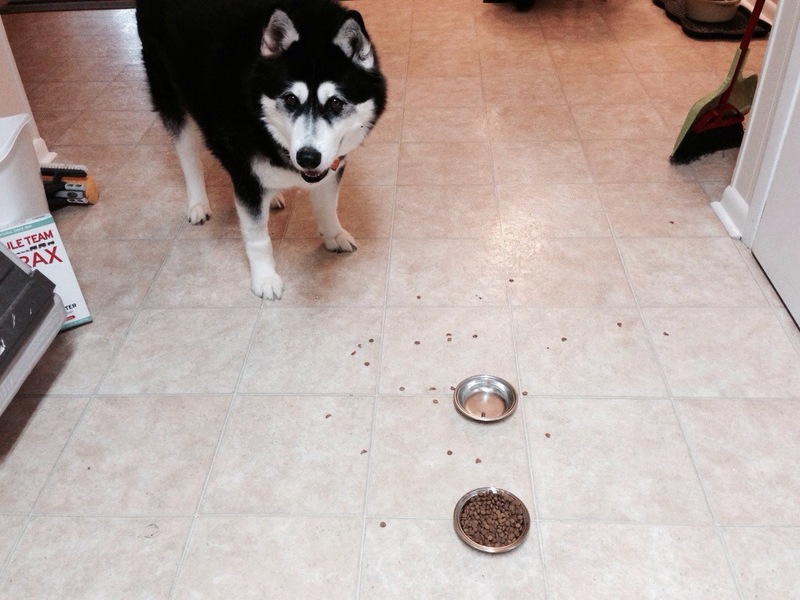 Our pup friends would always swear that they never ate anything they found on the floor. They were terrible liars. Rumpy looks so innocent in that picture. It must be some other animal that comes in and steals your food. The other day, the vet told OurGirl that any cat over 7 years old is considered a SENIOR!! Whut? We’ve all made a pact to bite HerAnkle next time we’re at the clinic! You have been totally called out, R. And your innocent face is NOT working! Malachi is pretty chunky. It is a shame that you have to go on a diet because of him. Hey, Rumpy – we have never had cat food – is it really THAT good??? OH yeah! It’s like cookies and fox poop all rolled into one! We’re gonna bug our bipeds to get cats so we can eat their food. Our Tommy never steals anything but #1 still puts all our food up on either a table or countertop! You are quite the poet and we look forward to more of your great work. We just have kitties here, but we all feel for you. Yow guud poe-em June Buggie!! Me iz on a speshell bowel kibble called Fiburr Reesponse n it iz nommie! MOL he almost terned green, MOL…. Great poem June Buggie! We know all about cat food stealing doggies! Mazie used to scarf down our food even on the counters until mom found the right bowls and spot where she can’t reach them.